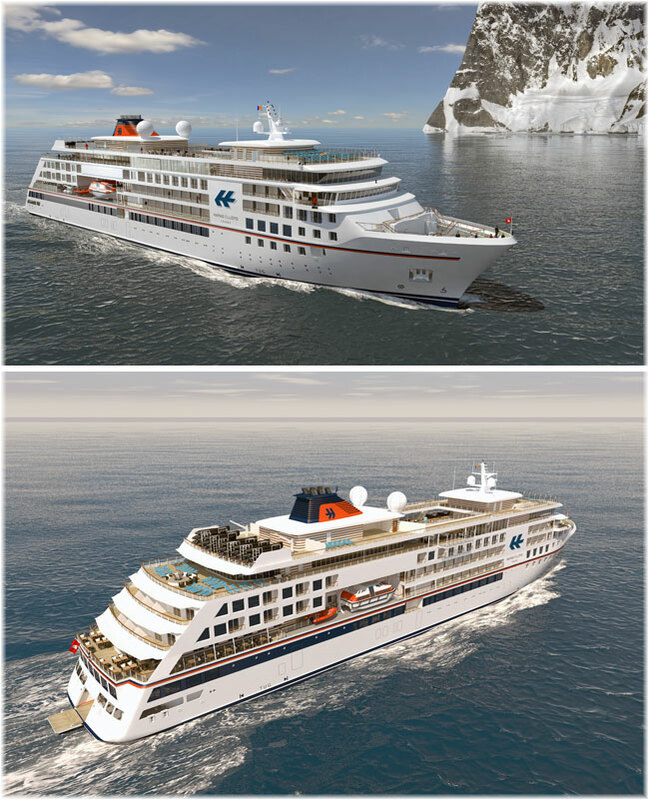 Hapag-Lloyd Cruises has announced plans for two 240-berth expedition cruise ships that will be the third and fourth in the world to be constructed to Polar Class. To be delivered in 2019, they will follow the Crystal Endeavour and Scenic Eclipse, both due in August 2018. Down Under in Chile, Cruceros Australis have confirmed an order for a 210-berth cruise ship from Chilean builders Asenave. Meanwhile, we also have a look at scrubbers on cruise ships. Hapag-Lloyd Cruises, a member of Germany’s TUI Group, has confirmed plans for two new expedition ships. The two 240-berth vessels are being designed and constructed by Fincantieri subsidiary Vard in Norway. Interior design will be by Oceanarchitects of Hamburg. The order firms up a letter of intent that Vard announced on May 31 with reference to an “undisclosed cruise company” and the contracts for the two ships are subject to finance. The ships’ hulls will be built by Vard’s shipyard in Tulcea, Romania, and final delivery is scheduled from the shipbuilder’s Langsten yard in Norway in March and October 2019, respectively. Developed by Vard in close cooperation with Hapag-Lloyd Cruises, the luxury expedition cruise vessels will be approximately 16,100 gross tons and have dimensions of 453 by 72 feet. Each ship will have seven passenger decks, with accommodations for a total of 240 in 120 cabins and suites and a high proportion of balcony cabins. Each ship will have a crew of up to 170. Designed for cruising the polar regions of the Arctic and Antarctica, they will be built to Polar Class PC6, and will also be capable of operating in warm water areas such as the Amazon. On-board Zodiacs will allow landings in otherwise inaccessible expedition areas. The ships will also feature a water sports marina at the stern. Karl Pojer, ceo of Hapag-Lloyd Cruises said the newbuildings will help the company further develop its expedition segment. Their 480 lower beds will offer 38% more capacity than the 348 berths presently available on the company’s existing expedition ships, Hanseatic and Bremen, which will have been in service for almost twenty-five years by the time the new ships are delivered. The new ships “will also serve to strengthen our leading position in this market, in particular at the international level,” said Pojer. One of the ships will serve the German-speaking market in Germany, Austria and Switzerland, while the other will serve that market plus the Benelux, the UK and the US. Also being constructed by Vard, the four smaller expedition ships that are being built for Ponant, at 10,000 tons and 420 feet, will be “traditional” Ice Class 1 ships rather than the Polar Class vessels Hapag-Lloyd has ordered. Expedition line Cruceros Australis, which cruises Patagonia, the Chilean Fjords and Tierra del Fuego, has confirmed that it is building a new ship to replace the 130-berth Via Australis. The Via Australis was sold earlier this year to Lindblad Expeditions, who will now sail her in the Galapagos. Her earlier sister ship, Mare Australis, also now sails in the Galapagos, for Metropolitan Touring. This leaves Cruceros Australis with just one ship, the 200-berth 4,508-ton Stella Australis, built in 2010, until the company is able to add a second ship in October 2017. The new ship, for which a contract was signed in February, will be “a streamlined, modern vessel, comparable to the Stella Australis,” the company said. As with her earlier sister ships, the Stella Australis was built at Chile’s Asenav shipyard in 2010. The new ship is being built in the same shipyard, located in Valdivia, Chile. Asenav is also building a small Great Lakes carferry for the Ontario Government, for delivery in 2018. 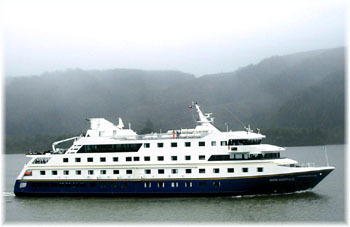 Cruceros Australis is part of Chile’s Comapa Group, which also includes Navimag Ferries. Navimag also offers tourist outings between Puerto Montt, Puerto Chacabuco and Puerto Natales on two overnight ferries, the 14,798-ton Eden and the 9,951-ton Evangelistas. One of the key issues facing the cruise industry is the new stringent limits on the sulphur content of marine fuels used when operating in Emission Control Areas (ECAs), which entered into force on January 1, 2015. 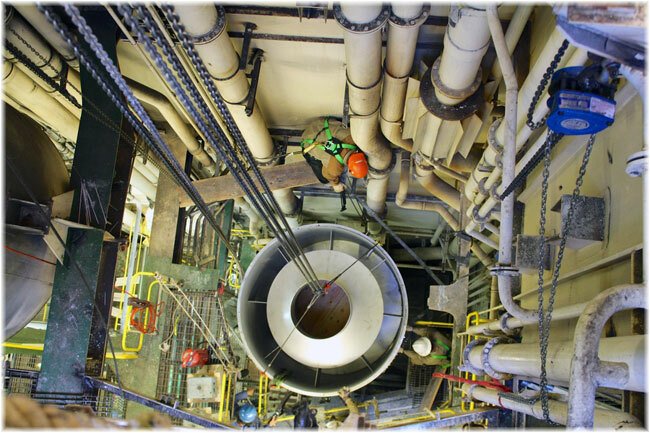 This has been leading cruise lines to examine alternatives for the installation of exhaust gas scrubbers to help meet these more stringent limits. Scrubbers allow cruise lines to continue to use heavier but less expensive fuels. But the appearance of ships such as the Independence of the Seas can be seriously marred when an exhaust scrubber was installed, for example here next to her rock climbing wall. Without cover or screen to hide its basic utilitarian purpose of scrubbing polluting elements of the ship’s diesel exhaust emissions, the effect can be quite unaesthetic. 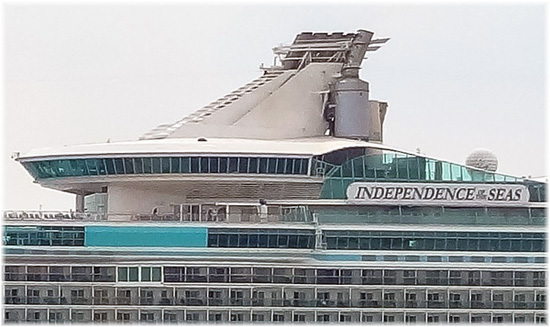 These installations can be either internal or external but this shot of the Independence of the Seas at Southampton shows how unsightly they can be if not carefully installed. On the other hand, perhaps some consider the rock climbing wall unsightly anyway, as they may many of the red, green, orange and blue children’s waterslides on more and more contemporary cruises ships designed for the family trade. Dozens of cruise ships have now been retrofitted with scrubbers, most of them not so obvious.